Tiger student-athletes have the opportunity to apply for support grants from the PVC by completing an application process. If their community-based project is selected, the PVC will offer funding and operational assistance to the student-athlete(s), assisting them in seeing their ideas through to fruition. Manny Sardinha ’12 appears at right, at his 2011 PVC Service Circle event supporting the A-T Children’s Project (www.atcp.org). Above and beyond the opportunity to attend Service Circle events, you will also receive the annual PVC Membership Pin, invitations to attend additional PVC events for you and a guest, and a subscription to the PVC News (published quarterly). 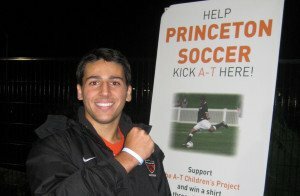 Are you a current Princeton student-athlete and interested in submitting a project for grant consideration? For more information about PVC giving options, click here. Questions or concerns regarding membership levels can be directed to Carolyn Cooper, PVC Assistant Director, at 609-258-6695, or by email at cac5@princeton.edu.